With the end of the school year closing in fast, research commitments, and tons of traveling, we've barely been able to keep our heads above water! We'll be back (no, really...we will) with new posts on June 11th. In the meantime, enjoy the warmer weather! In a group of 587 postpartum women, infant crying was assessed at 5-6 weeks of age followed by a maternal depression assessment at 8 weeks postpartum. Total amount of crying was recorded for 4 days and the amount of inconsolable crying was also recorded. Symptoms of depression were assessed using a survey, the Edinburgh Postnatal Depression Scale (EPDS). At 5-6 weeks postpartum, the majority of mothers (about 57%) reported no inconsolable crying and about 13% of mothers reported more than 20 minutes per day of inconsolable crying. Mothers with “possible depression” (EPDS score ≥9) reported more minutes of infant distress (crying) compared to mothers with no depressive symptoms. They also reported significantly more inconsolable crying than mothers without depression. Mothers were twice as likely to be categorized as having “possible depression” if their babies had “colic” (defined as more than 3 hours of crying per day) than if their babies did not have colic. Mothers reporting more than 20 minutes of inconsolable crying per day were 4 times more likely to be categorized as having “possible depression” than those that reported no inconsolable crying. This study found that mothers who felt unable to calm their infants (inconsolable crying) was more predictive of postpartum depression than total number of hours of crying. This research group wondered if providing mothers with education about normal infant crying and ways to soothe their crying babies would be helpful in preventing depressive symptoms by reducing reported inconsolable crying. The authors state that further research is needed to confirm this. Our “Baby Behavior” research has shown that caregivers need tools to deal with the normal crying that occurs in young babies. Knowing what to expect and that crying is not random, but is a form of communication, can help parents feel more prepared and less stressed. Using repetition to soothe instead of trying a variety of different soothing techniques is the key. Find what works for your baby, such as rocking or singing and repeat it over and over until the baby calms down. Be patient. 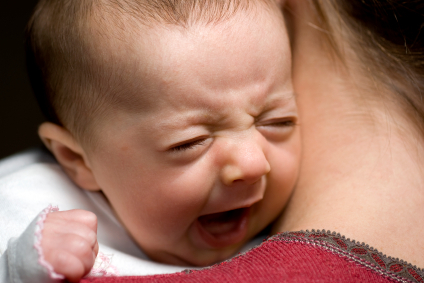 If your baby is very upset or has been crying for a while, it may take time for her to calm down. 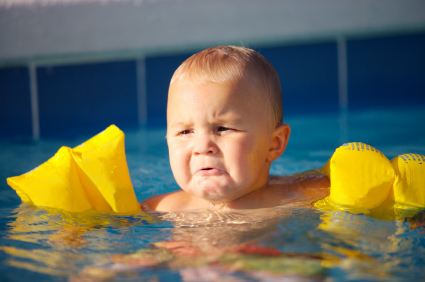 For more information about infant crying basics, click here. For tools to cope with crying, click here. Some babies cry more than others. For more information about persistent criers, click here. Radesky JS, Zuckerman B, Silverstein M, Rivara FP, Barr M, Taylor JA, Lengua LJ, Barr RG. Inconsolable Infant Crying and Maternal Postpartum Depressive Symptoms. Pediatrics. 2013;131:1-8. We hope all of our mother-readers have a wonderful restful Mother's Day! The American Academy of Pediatrics (AAP), American College of Obstetrics and Gynecology (ACOG) and American Academy of Family Physicians (AAFP) all recommend parents wait to start solid foods until about 6 -months of age. Why? Babies are not developmentally ready for solid foods until around this time and babies started on solid foods early are also at higher risk of certain chronic diseases such as diabetes and obesity . Yet, many parents start solid foods earlier than is recommended. A group of researchers from the Centers for Disease Control (CDC) in Atlanta, Georgia decided to look at the age at which parents start solid foods and whether or not this varies by feeding method (breastfeeding, formula feeding, or a combination of breast milk and formula feeding,). They also assessed the reasons why parents start solid foods in the first place. 1334 mothers were asked to complete food-frequency questions as part of a larger infant-feeding study. 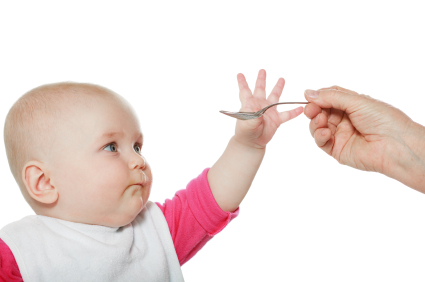 Reasons for starting solid foods before 4 months of age were assessed as well. What they found was that fewer mothers who were exclusively breastfeeding started solid foods early compared to mothers who were formula-feeding and mixed feeding (24.3% exclusive BF, 52.7% formula fed, 50.2% mixed fed). About one quarter of mothers breastfeeding exclusively started solids before 4 months of age whereas about half of babies fed formula or both formula and breast milk were started on solids early. A baby showing hunger cues should be fed and babies only need breast milk or formula for the first 6-months of life. Sometimes it might seem that babies are more hungry than usual. There are several reasons why this might happen. Babies go through growth spurts when they will eat more than usual. This is normal! It does not mean your baby needs to start other foods besides breast milk or formula. 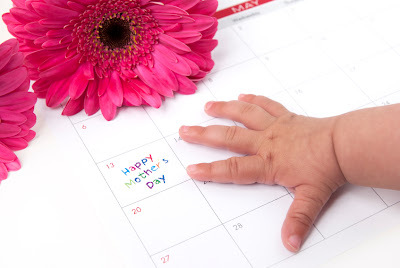 Every baby is different, but growth spurts are normal around about 7-10 days, 2-3 weeks, 4-6 weeks, 3 months, 4 months, 6 months and 9 months of age. Watch for hunger cues to be sure your baby is hungry. Babies may also “act hungry” about 10-15 minutes after a feeding. This fussiness is generally caused by either gas or a bowel movement that is making the baby uncomfortable. Sometimes your baby will wake up after you lay him down to sleep after a feeding. This does not mean that your baby is still hungry! For more information about why this and other behaviors occur, click here. While it is very exciting to reach the milestone of starting your baby on solid foods, breast milk or formula is enough nutrition for your baby to grow and develop normally for the first 6-months of life. Exclusive breastfeeding until 6-months is also recommended by the AAP. When your baby is old enough you will get to introduce many new foods and share lots of feeding experiences! While we don’t know exactly why the mothers in this study thought their babies wanted the food the mothers ate, we do know that it is developmentally normal that around 4 months of age babies develop the ability to point at things they want to learn about. Sometimes parents misinterpret this pointing as the baby “wanting” the food that the parent is eating. Your baby is just trying to explore his new world! Offering other things to reach for such as a toy or book can fulfill your baby’s need to explore. The AAP, ACOG and AAFP all recommend waiting to start solid foods until about 6-months of age. However, it can be confusing when doctors recommend something different than what you would expect. When other recommendations are made that you are not familiar or comfortable with, discuss the reasons for the recommendation and any concerns you have with the health care provider. Starting solid foods does not help babies sleep longer. One study (Macknin 1989) showed that adding cereal to a baby’s diet before bedtime did not make the baby sleep any longer. Understanding hunger cues and other normal baby behaviors may be helpful in delaying solid food introduction! Knowing why babies behave the way they do may help parents address the common concerns listed above without having to start solid foods early. When did you start solid foods with your baby? How did you make the decision to start at that age? Clayton HB, Li R, Perrine CG, Scanlon KS. Prevalence and reasons for introducing infants early to solid foods: variations by milk feeding type. Pediatrics. 2013;131(4):e1108-14.